More Than 50 Killed In Latest Bombings In Iraq : The Two-Way Shiite pilgrims in Karbala were targeted. Iraq security forces gather at the site of an explosion in Karbala on Thursday, as a spate of attacks killed at least 51 people, most of them Shiite pilgrims. "Three car bombs blasted through security checkpoints ringing the Iraqi holy city of Karbala on Thursday and killed at least 51 people, most of whom were Shiite pilgrims headed to observe yearly religious rituals," the Associated Press reports. According to the BBC, "the blasts happened on two routes being used by pilgrims taking part in the Shia Muslim commemorations of Arbaeen." Al Jazeera writes that "the first attack struck Karbala's northern outskirts, while the second blast occurred about 15km south of the city, the head of Karbala provincial council Mohammed Hamid al-Mussawi told the AFP news agency." 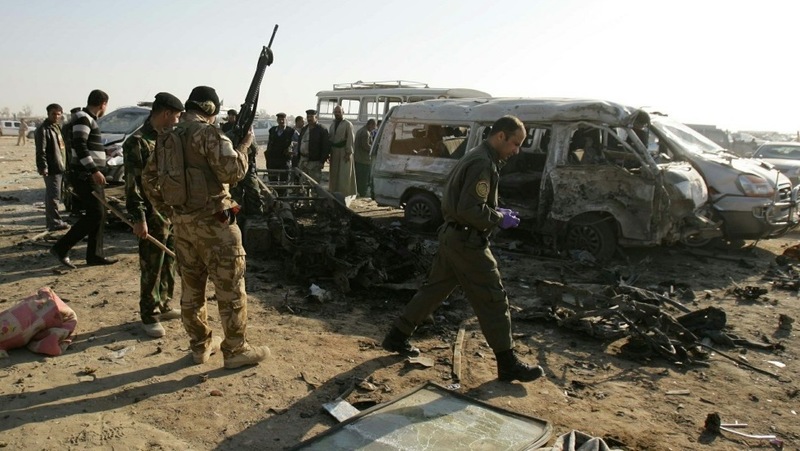 Tuesday, a suicide bomber killed dozens of people at a police recruitment center in Tikrit, Iraq.